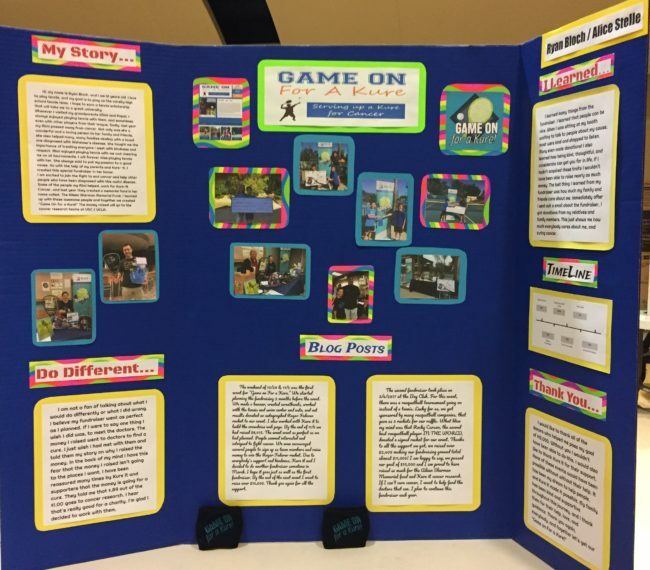 My son, Ryan, completed his school project and presented his fundraiser, Game On For A Kure at the school district event last night. I am so proud of the work he did raising money for the Aileen Sherman Memorial Fund and Kure It Cancer Research. At the end of the day he raised nearly $11,000 for underfunded, orphan cancer, research. Ryan’s robotics class at school, along with all the computer science/robotics classes in the middle & high schools across the district were required to complete what they called the 20% project. It was a wide open assignment asking the kids to find a way to create a product or service that could help the community. It was amazing to see so many innovative products and ideas to reach outside their young selves and help others. This is Ryan’s second fundraiser where he put his passion for playing tennis to a purpose. My mom, his Mimi, used to say, do what you love and find a way to put that passion to a good cause. So the first year, Ryan used his tennis and during a local tennis tournament, found a way to raise money for war veterans. 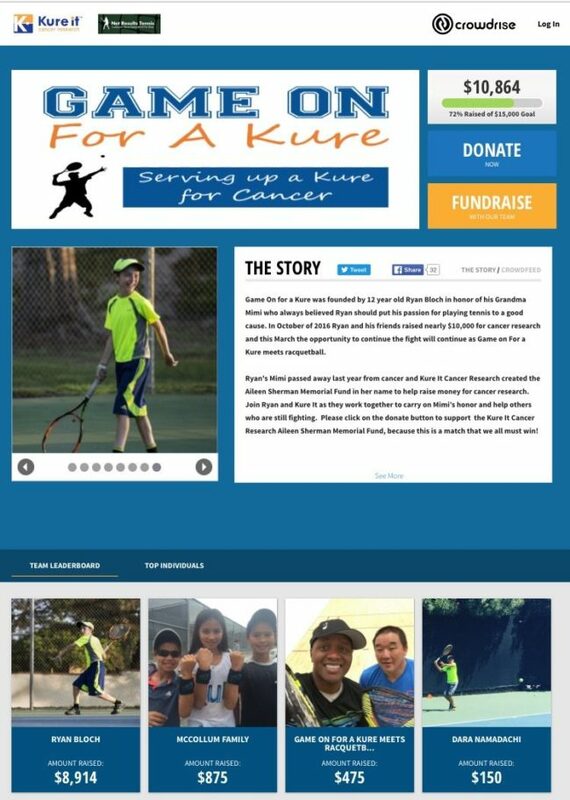 This year he up-ed his game and created “Game On For A Kure”, joining forces with Kure It, the USTA, and Calabasas Tennis Center to raise money for his Mimi’s fund and support underfunded cancer research. He even created a follow up fundraiser at The Bay Club where he joined forces with racquetball tournament director Wes Obana, and The PowerBoost Health Bar. The combined efforts of these 2 tournaments, along with the support of family and friends is what helped him reach nearly 11k. Ryan was very proud of all the hard work he had put into his project. 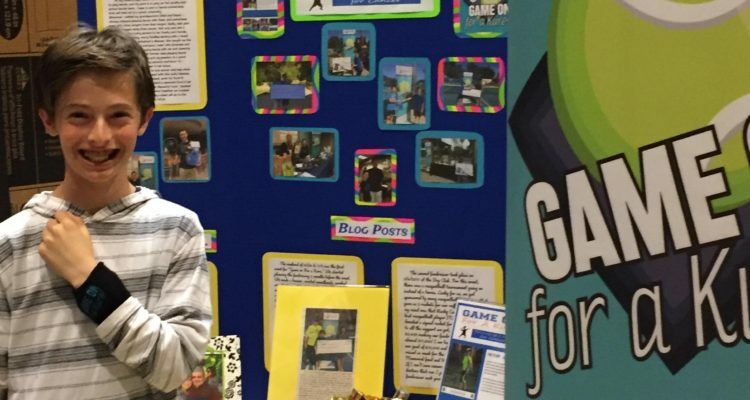 He wrote “his story” and created the board completely on his own. He learned so many amazing lessons. And, he is looking forward to launching his next event! I am seriously, da proud mama here! To everyone who supported his efforts, THANK YOU!